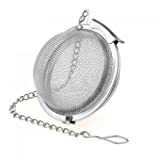 Use a mesh strainer to take out seeds, herbs, and pieces of hard food from your broths, sauces, dressings, and more! The holes in the mesh are smaller for better filtration or larger for middle filtration. Each strainer has a hook so you can hang them wherever you like in the kitchen for easy access.